Copyright © 2010 Cambridge University Press & author/society?? Although it has long been known that practicing a motor task with one limb can improve performance with the limb opposite, the mechanisms remain poorly understood. Here we tested the hypothesis that improved performance with the untrained limb on a fastest possible (i.e. ballistic) movement task depends partly on cortical circuits located ipsilateral to the trained limb. The idea that crossed effects, which are important for the learning process, might occur in the ‘untrained' hemisphere following ballistic training is based on the observation that tasks requiring strong descending drive generate extensive bilateral cortical activity. Twenty-one volunteers practiced a ballistic index finger abduction task with their right hand, and corticospinal excitability was assessed in two hand muscles (first dorsal interosseus, FDI; adductor digiti minimi, ADM). Eight control subjects did not train. After training, repetitive transcranial magnetic stimulation (rTMS; 15 min at 1 Hz) was applied to the left (trained) or right (untrained) motor cortex to induce a ‘virtual lesion'. A third training group received sham rTMS, and control subjects received rTMS to the right motor cortex. Performance and corticospinal excitability (for FDI) increased in both hands for training but not control subjects. rTMS of the left, trained motor cortex specifically reduced training-induced gains in motor performance for the right, trained hand, and rTMS of the right, untrained motor cortex specifically reduced performance gains for the left, untrained hand. 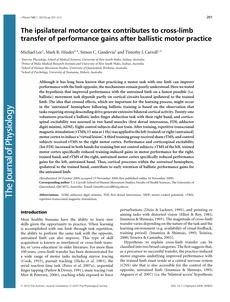 Thus, cortical processes within the untrained hemisphere, ipsilateral to the trained hand, contribute to early retention of ballistic performance gains for the untrained limb.